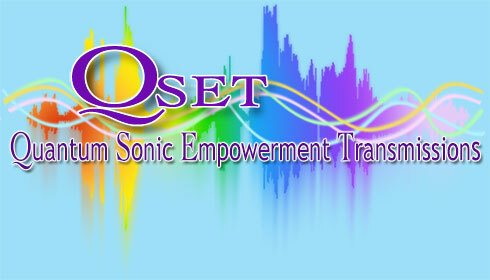 This term we use to describe this music, QSET, is a very powerful description offered to help you embrace the concepts presented within our soundscapes in a short concise phrase. Gary Chambers is the originator of this musical style and has spent his entire lifetime perfecting the techniques he uses to create his library of multidimensional sounds. Gary is a master sound designer; using computers, sound modules, synths and raw organic sound samples to create his music. His process of composing is to connect directly to the Quantum realm/Source Vibration/ALL — directing his intentions towards the specific goals of a composition. He captures the data he receives as sonic information (non-linear language/frequencies) within the sounds he creates and then translates that into the melodies, rhythms, patterns, harmonics and modulations. Taking this sonic data and turning it into something musical is the magical process we call Quantum Sonic Empowerment Transmissions / QSET. This is a process he continues to refine with each new soundscape he creates. He has the ability to simply bring through the music in a real time setting and he also enjoys the composing process where he lays down various sound layers and tracks to build a moving, living multidimensional landscape of sound. QUANTUM = the most minute form of measurement to capture the vibrational essence of ALL that exists in form and not in form. The Quantum state is non-visible, yet permeates throughout everything that exists in this and all dimensional realms. It can be equated to what is called Source Vibration, which can also be synonymous with the most expansive concepts of God/Source/Allah/Yahweh/Jehovah/Elohim/Allah, etc. SONIC = Sound is the fundamental aspect of our existence. It is the glue so to speak that keeps us all focused in our 3rd dimensional realm. Sound is Vibration…Vibration is Energy in Motion…Everything Vibrates…Consciously created Sound resonates through and beyond our deepest levels of desires, thereby assisting us in all our manifestation processes. EMPOWERMENT = To move forward in your life, you need to embrace the personal empowerment within you. We infuse all our soundscapes with that energy so that you can connect deeply with those aspects of Self. TRANSMISSIONS = This sonic information is received via direct downloads from Source Vibration (a collective represenation of all sources that have the positive upliftment of humanity at the core of their message). The combined talents, tools and skills Gary uses to bring through these soundscapes makes this connection to the intended signals – a blending/merging of hardware, software and wet-ware (Gary’s neural field, mind and Consciousness; bio-energetic matrix).